ABCD Diaries was given a copy of this book for review purposes only. We were in no other way compensated. The opinions expressed in this post are ours and ours alone. 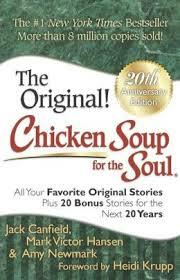 "Twenty years later, Chicken Soup for the Soul continues to open the heart and rekindle the spirit. Celebrate the twentieth anniversary with the classic book that inspired millions — reinvigorated with bonus stories of inspiration! You will find hope and inspiration in these 101 heartwarming stories about counting your blessings, thinking positive, and overcoming challenges." What we thought: This book includes all the great stories of Chicken Soup for the Soul and some great new additions. The perfect collection for Chicken Soup for the Soul lovers! These heartwarming, inspirational and often humorous stories all in one book:) ABCD Diaries gives this book an A+! AquaBall Keeps Kids Hydrated This Summer! Beyond Bedding Review + Sweepstakes! Celebrate National Mustard Day with French's! Bulu Box For a Healthier You! Nature's Own Bread and Buns, Perfect for Summer!